Cathay-raht Veteran is a common Willpower creature card. It is part of the Core Set. "This one's blade is yours." "Khajiit is ready to help." 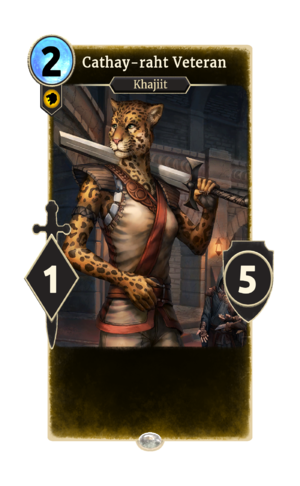 The card is named for the Cathay-raht breed of Khajiit, described as "Jaguar-men". This page was last modified on 15 February 2019, at 11:49.